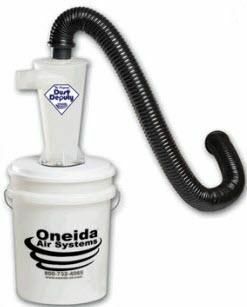 The dust deputy is a great dust separator for my Ridgid shop vac. 2. Its pretty awkward moving it unless you build a cart. 3. Static electricity during dry times is a pain and a hassle as some dust gets in because it tends to stick to the cyclone. 4. The container fills up quickly, probably a 35 gal drum would be nice. Otherwise, it is a great addition to my shop. So, After sucking up the usual shop mess from the table saw, router table, mitre saw and sander, the Dust deputy filled up but the vacuum was nice and empty, except for about 1 teaspoon of dust. Thanks for reading my brief review! One way around item 2 is to put a weight at the bottom of bucket the dust deputy sits on…a disc brake (used) works really well…mine was a Hyundai 2008. I bought the one with two buckets. It works great with my Shop Vac. I hooked it up to my planer and it captured all the chips with basically nothing actually making its way to the vac. For my small shop (part of a one car garage) it is perfect. I have the one with the 2 buckets. Don’t make it attach to your vac, it’s better to build a seperate cart with your DD and your vac. As for the static I wound some copper wire around it and and used an alligator clip to ground it to an outlet. I move mine to whatever machine I’m using and vac the garage floor also. My shop vac filter is over a year old and still looks good. All plastic buckets hold static, you can even wipe em down with a dryer sheet. I believe you can get 6 and 7 gallon buckets with same tops which will give you a bit more room for chips before dumping. Available at U.S. Plastics in Lima Ohio, place sites right next to I-75. I am going to the local dump for a good used 35gal steel drum with a lid. I’ve had a SDD setup for about 5 months now, and have upgraded the plastic bucket to a industrial recycle bin – heavy-duty ribbed plastic, at about 40 gal capacity. With this, I’ve bolted the SDD to a 3’ diameter 1/2” MDF plate, properly drilled for the SDD attachment, then used EDPM (weather sealant rubber) to rim the can – this creates an air-tight seal. With this, the SDD and my FEIN shop vac can really pull in the chips. I agree the plastic SDD is over-priced for what it is (the cost to produce); however, it’s a great value in what it does. I got one of these for Christmas last year. 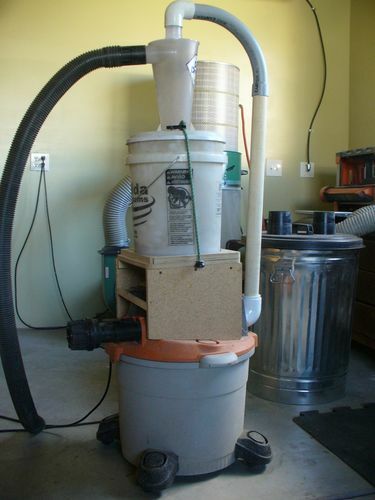 After connecting to my shop vacuum, we built a DIY dust collection system out of shop vac parts and PVC pipe and fittings. The pipe was placed in the rafters with connectors above my stationary power tools, caps for when they were not in use, and all with parts I had. I didn’t spend an extra dime in doing this. No additional loss of suction with the shop vac, as the bag is virtually empty, and I just empty the cyclonic bucket when it gets full. This thing is awesome!